This morning I worked with some teachers at an area school around the topic of Google Sites with a little YouTube and other Google Apps for Education topics sprinkled in. It was straightforward for me, something I’ve done a lot and rather enjoy doing – teaching teachers and administrators about Google Apps for Education. Speaking to the power of connectedness and rethinking what teaching and learning should look like in 2015. After a comment I received from a teacher when the workshop was over, I finally decided to blog about my style of facilitating professional development. 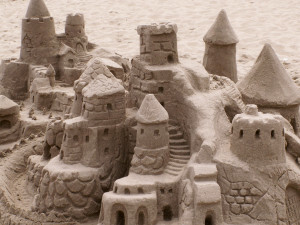 I feel kind of silly blogging about it because it seems rather obvious to incorporate “sandbox time” into adult learning, however, I’m discovering it’s not so obvious to other PD facilitators. Teachers love to learn about new tech tools. All of us in the edtech world do. We want to (or should want to) stay on top of the latest and greatest; to explore new ideas for teaching and learning with technology. If we really want teachers to move forward, however, we should be sticking to the old adage of “less is more”. As long as you’re moving yourself forward professionally, who cares if it’s only 1 or 2 things that you get really good at? I’d rather be really comfortable with just one or two things, yet we still see sessions at conferences and workshops titled, “60 ____ in 60 minutes” and so on. This is something I remind teachers often – don’t get hung up on how fast or how much you’re moving forward, the point is to move forward! Back to “sandbox time”. I format my workshops with this component being the most important part in my opinion. I share a little bit, give sandbox time, share a little more to build upon what we did earlier, then more “sandbox time”. Kind of like shampoo directions except it’s for facilitating professional development. One more than one occasion I have had a teacher come and say to me afterwards (as I did today) how much they appreciated me formatting the learning experience this way. The thought I usually have to myself around this is something like, “Why would I make you listen to me talk for 3 hours nonstop and cram as much down your throats as possible?!”. This isn’t an acceptable format for learning; for teachers or students. If you’re providing professional learning opportunities to teachers and you want the learning to be meaningful and increase teacher comfort, especially around technology integration, try incorporating “sandbox time” into your next conference session or workshop! Teachers will feel more comfortable applying their learning and they’ll appreciate the departure from the routine ‘sit and get’ method!